Liberty Park is located in one of the downtown neighborhoods of Salt Lake City, Utah. If you’ve been visiting this blog for any length of time, you will have seen various photos of geese and gulls and ducks and squirrels and huge Cottonwood trees and fallen leaves and…other sundry things. The park was established in 1883 and is on an 80-acre plot of land that used to be owned by Brigham Young. It has a lake with two islands, seasonal amusement rides, tennis and basketball courts, a greenhouse, horse-shoe pits, and various picnic/barbecue areas with nearby playground equipment for the little ones. Liberty Park is also home to the historic Isaac Chase Mill, the Tracy Aviary, and the Chase Home Museum of Utah Folk Arts. If you’d like to read more about Liberty Park, please click on the highlighted name to follow a link to Wikipedia’s article. My little one has wanted to ride the boats on Liberty Park’s pond for quite some time now. 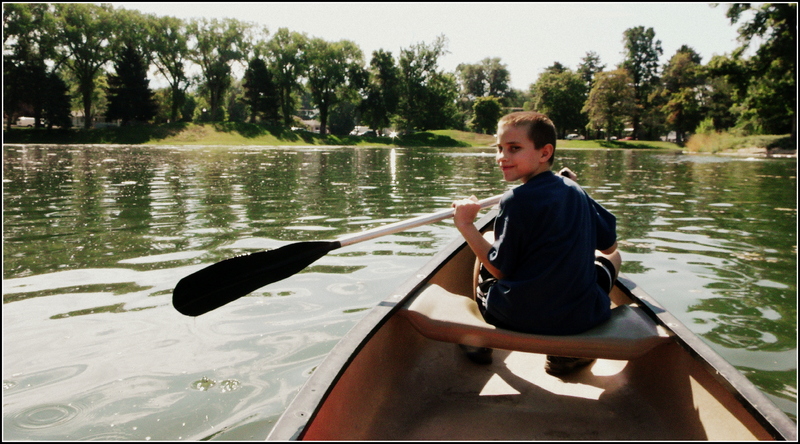 He has visited the park multiple times over our nearly two years here in Salt Lake City, but those occasions were often on busy and crowded Saturday mornings or during seasons when the boats were not available. 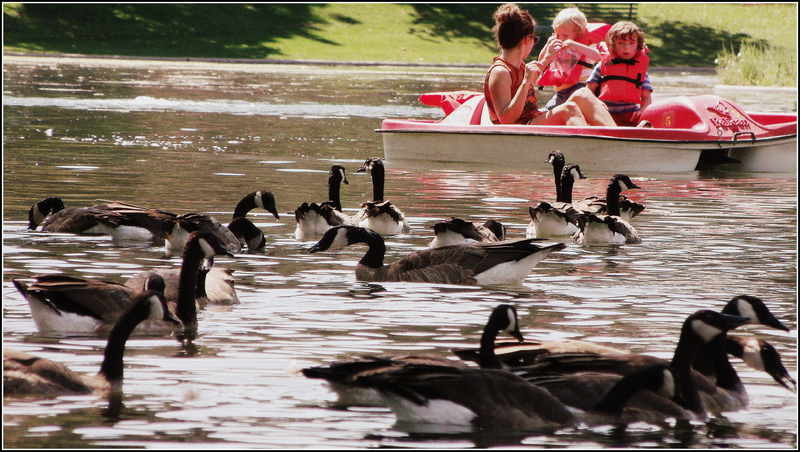 I suppose I could say that my little one took to the canoe like ducks/geese take to water…. 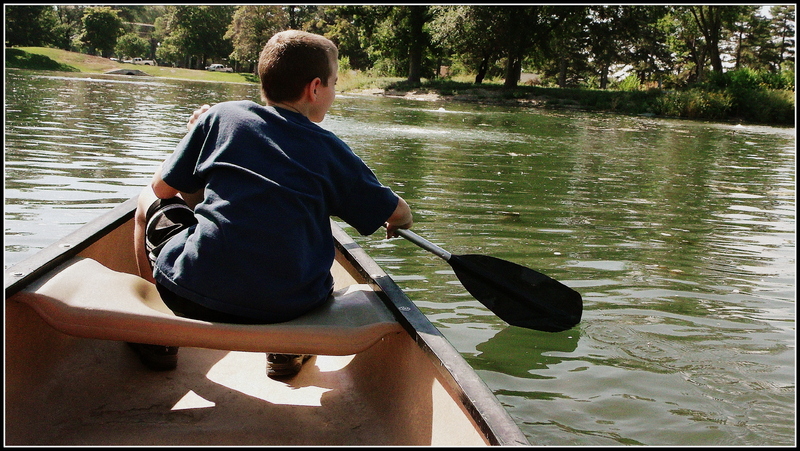 It was his first time in a canoe and he conducted himself like an old pro…. 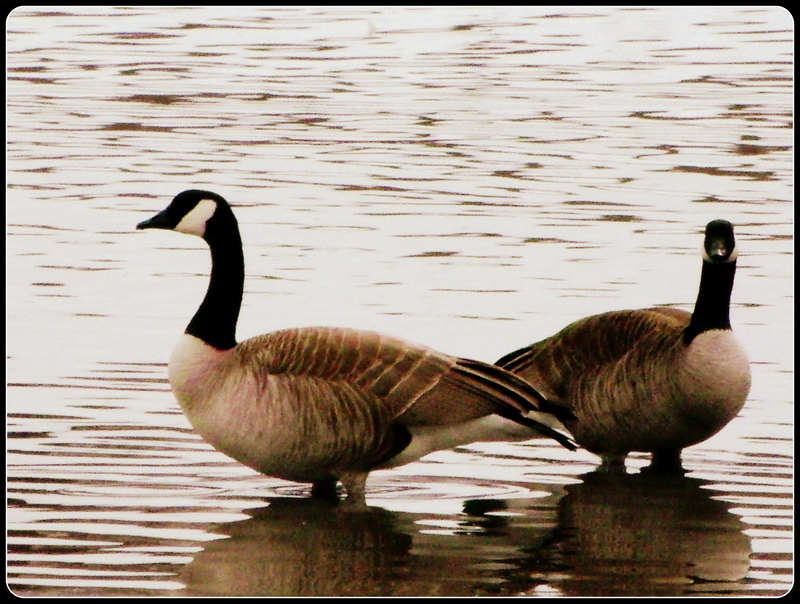 The Canada Geese (Canadian Geese?) are year-round visitors/residents of Liberty Park. I have seen and heard them in every month of the year and have watched as their little ones follow them about the pond in Spring and early Summer. 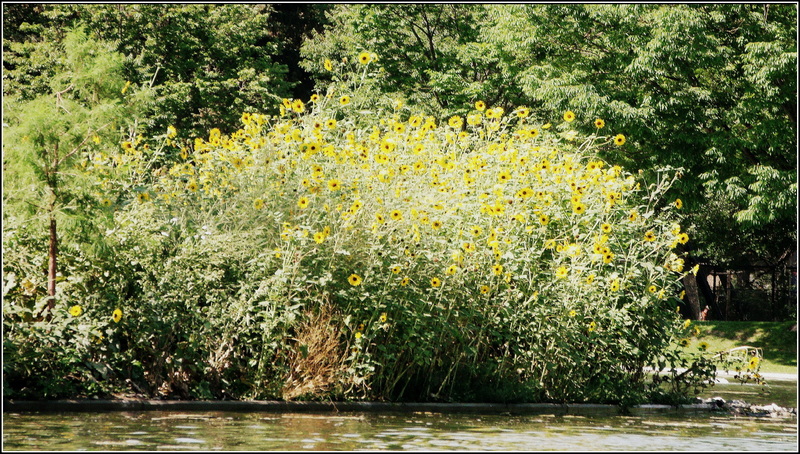 I’ve never seen their nests out in the more public areas of the park, so I would guess that they are on this sunflower-adorned island. The only way to reach this island is by boat, but I don’t think it’s an encouraged activity…and since people rent the boats for only 20 minutes per ride, I don’t know that too many of them would want to park the boats just to explore the little island. The island looks like a perfect nesting ground for the geese and ducks, and maybe even the gulls that frequent the pond. 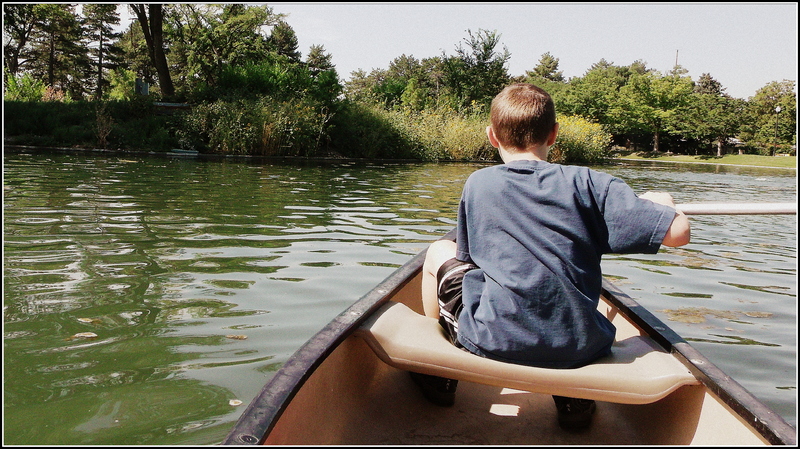 There was one canoe and three paddle-boats available…my little one went straight to the canoe. After we grabbed a bite to eat at the concession stand, we went back out on a paddle-boat like the one in the below photo. It might seem that there was a bit of traffic on the lake, but it wasn’t really too bad. 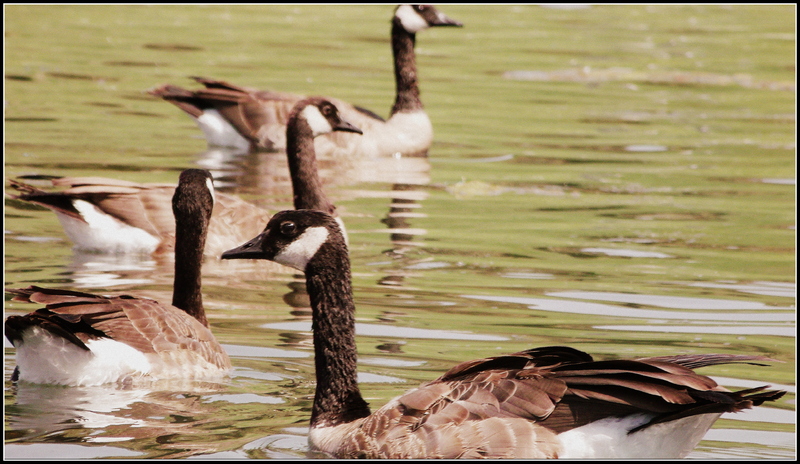 We had actually steered closer to the geese so I could attempt to get some close-up shots of them. I’m not sure what type of bird/duck this one is…probably not an Egret…but it was the first time I have seen such a creature at the park. After I got home and was processing the photographs, I couldn’t help but think that it looked like this guy was leading the other birds in song…. Ok…maybe not…. 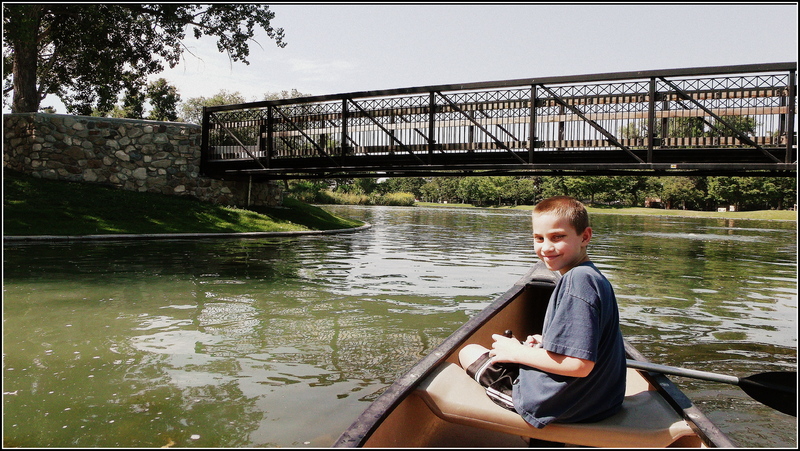 This is the bridge to the other island in Liberty Park’s pond. The island has a large gazebo, planters/flower-beds, huge Cottonwood trees, and nice park benches. When we had finished our paddle-boat ride (a bit after this last photo) and had walked less than 20 yards away from the dock, my little one asked when we would be able to come back and ride the boats again. It was nice that he had such a good time. 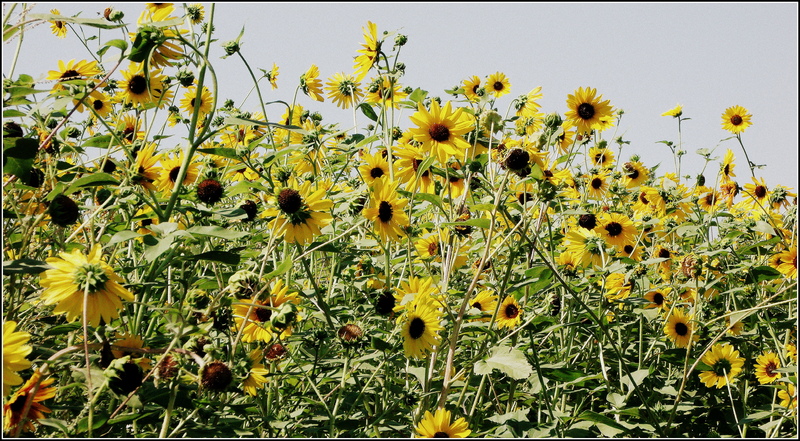 The stuff of memories…. I still think it’s odd to have Sea Gulls flying about…in the middle of the mountain-west…but I guess they enjoy living in proximity to The Great Salt Lake…. 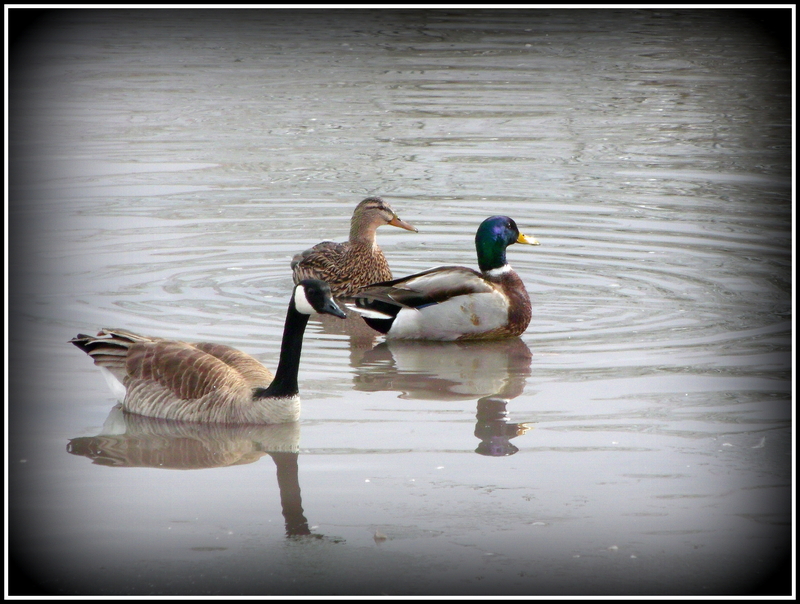 They also seem to enjoy hanging-out at the pond in Liberty Park. 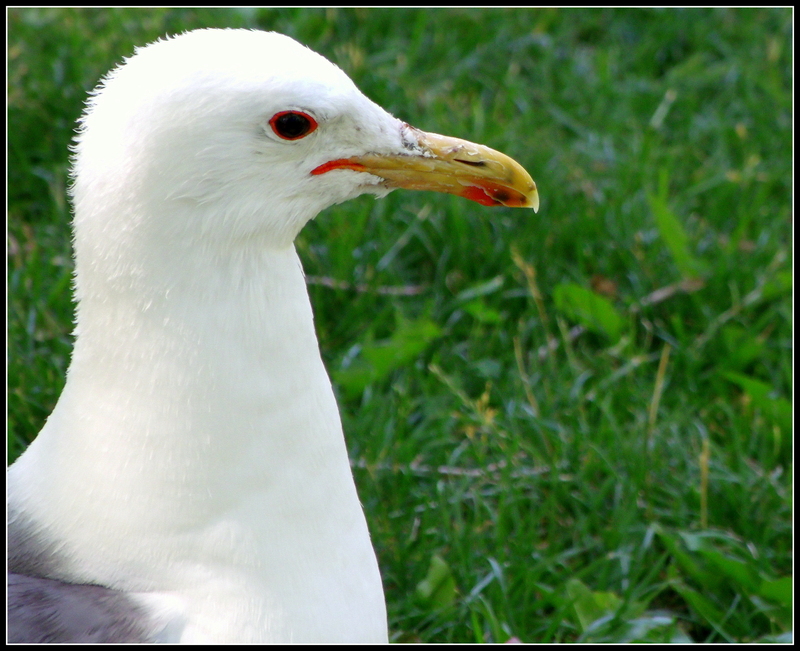 My friend Gunta has an affinity for Sea Gulls and frequently shares photographs of them in her blog “Movin’ On.” If you haven’t yet walked the sandy beaches of Gunta’s Oregon coastline, I heartily recommend a visit…beautiful sea-scapes, sea-lions, seals, and many other Pacific Northwest wonders…including Sea Gulls…. I don’t know how this particular specimen compares, or is related to the gulls that Gunta finds out on her pacific coast, but I think he’s kind of cute…I wonder if she’ll recognize him….